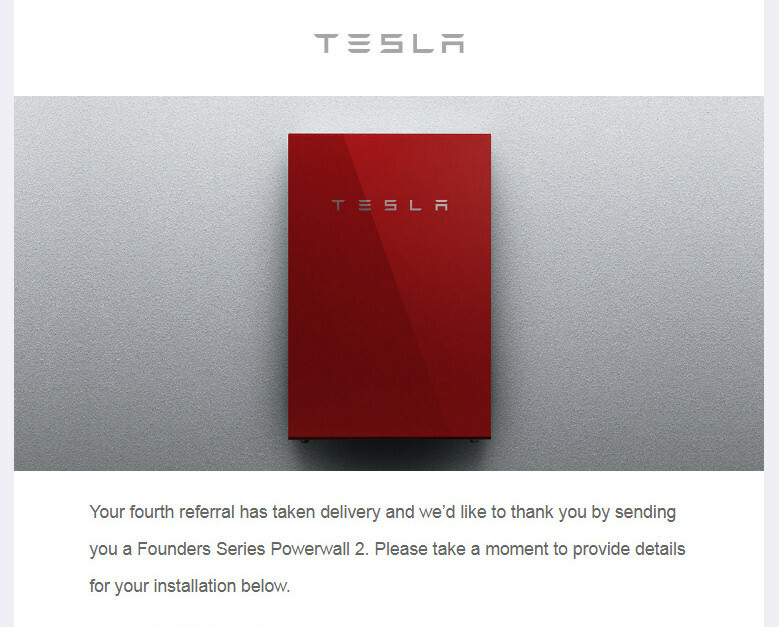 We just received an email from Tesla that we'll be receiving a Tesla Powerwall 2. Thank you to everyone that used our referral code. This will go well with our 12 kW of solar PV. I'll blog the install and show you how it impacts our energy utilization. Should I drain the battery before charging? Should I plug in every day? Will charging make the battery degrade? Q: Should I charge to 100%? A: Only when you need it. When you need a full charge, for a road trip for example, then, by all means, charge to 100% but this should not be your normal daily charge level. Each battery chemistry is a little different. Today's electric cars use Lithium-Ion batteries. Li-ion is "happiest" in the middle third of its charge range. This is where the electrons and ions of Lithium are relatively balanced between the anode and the cathode. For daily driving, if you can keep the charge within the middle third you'll maximize your battery life. So for daily driving, charge up between 70 to 80% and avoid discharging below 20%. This will put most of the battery usage in this sweet spot for extending battery life. Q: What If I Do Need a 100% Charge? A: Time the charge so the car does not sit at 100% for long. Charging slows down as the pack approaches full especially with DC fast charging. It can take as long to go from 80% to 100% as it did to go from 40% to 80%. Don't stay at a 100% charge for too long: Letting the battery sit at 100% for an extended period of time will result in battery degradation. So plan your charging such that you can hit the road soon after the battery hits 100% full. Q: What if I Need to Store My EV? A: Leave the battery at about a 60% charge. And leave it plugged in if your car allows you to stop charging at less than 100%. When your car will be sitting for a long time, you don't want to leave it at 100% charge. 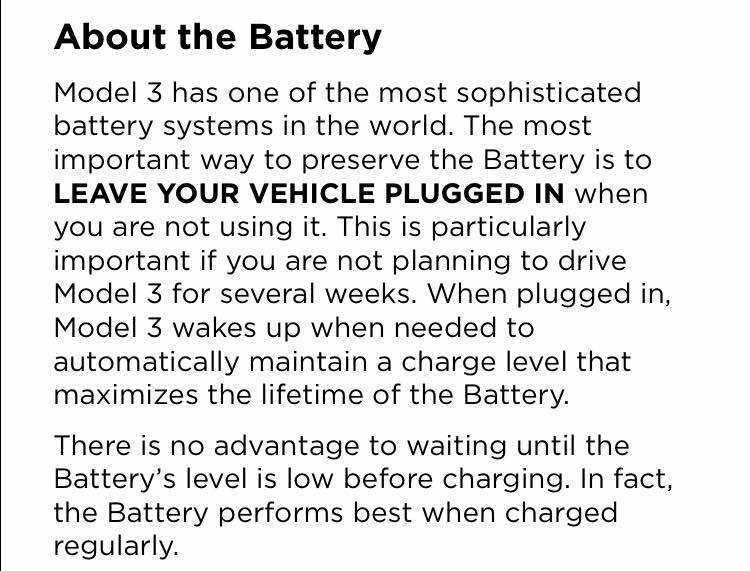 You do, however, want to have the car plugged in so it can run battery thermal management as needed. So to store your car, set the battery charge at or near 60% and plug in the car. 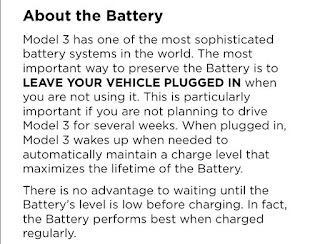 For one example, here's some of the relevant text from the Tesla Model 3 manual. Should I charge to 100%? No. Only charge to 100% for road trips and don't leave the car sitting at 100%. Should I drain the battery before charging? No. Li-ion batteries don't suffer from memory effects like Nickel-Cadmium batteries. Should I plug in every day? Yes. Set the charge level where you need it and plug in anytime you can. A plugged-in EV is a happy EV. Will deep cycling cause the battery to degrade? No. Modern EVs have software that prevents you from damaging the battery in any significant way by your charging habits. You can extend the life a little with careful considerations, but the car is for your use and fun. Charge it however you need to in order to get around as you need. 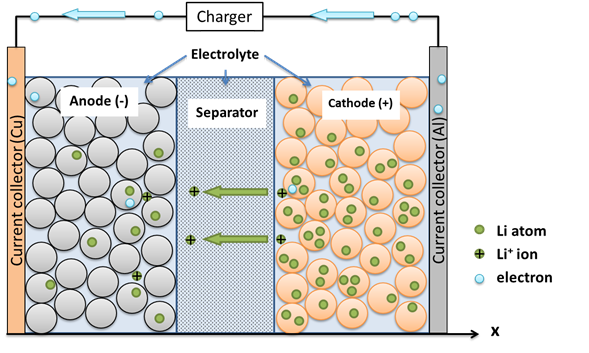 If you want to read more about the impacts of depth-of-discharge (DOD) and battery state-of-charge (SOC) on battery longevity here is an excellent paper on the topic. It explains that shallow discharging offers longest battery life. 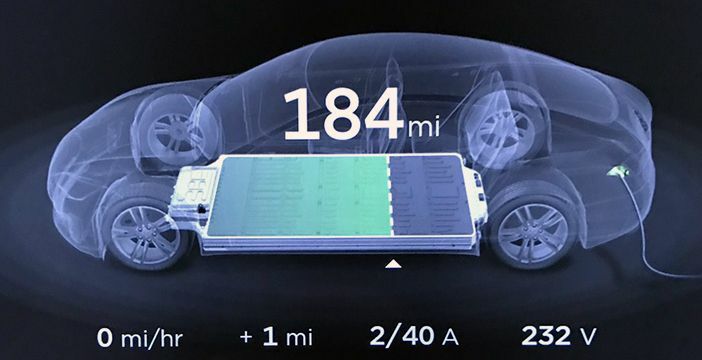 An EVs typically only allow 85% of the battery to be user exposed. So when your car says that it is 100% charged, that is 100% of the "user portion" of the capacity. This is done to prolong battery life. The paper further shows that full discharge cycles, like those used in many consumer electronics, allows for the longest runtime, but the battery generally has significant degradation within 2 or 3 years worth of charge cycles. This is okay for something that you replace every 2 or 3 years, but would not be good for a car.